Positive Detroit: Vote For Detroit Street Artists 'Hygienic Dress League' To Win $5000! 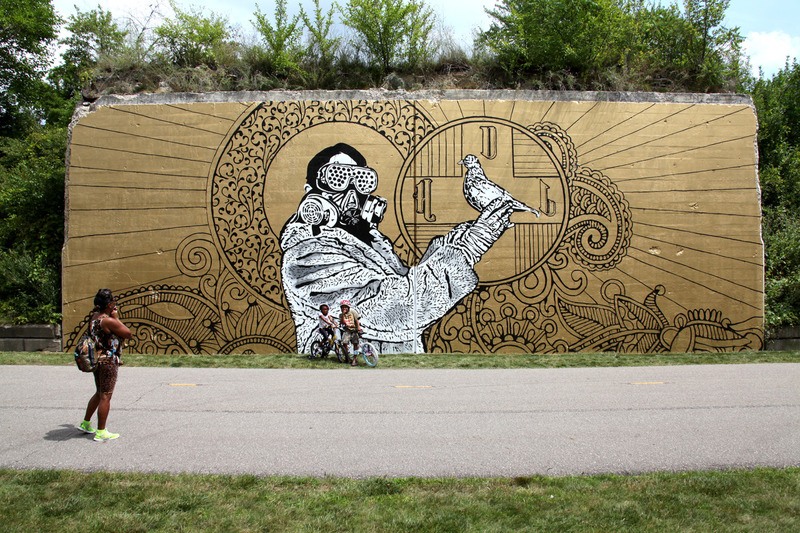 Vote For Detroit Street Artists 'Hygienic Dress League' To Win $5000! Port Austin is becoming an art destination. In 2013, the Port Austin community teamed with Detroit street artists hygienic dress league (HDL) on an open-air, large-scale installation using two sides of a 60-foot barn in Port Austin. In 2015, the Port Austin community worked with internationally-renowned Detroit artist, Scott Hocking, on a second barn project. For the project, Hocking disassembled a quickly deteriorating large barn, using the materials to invert the structure and construct a site-specific, ark-like sculpture. These installations garnered national press and have attracted visitors to Port Austin from around the nation. The projects have helped position the Port Austin area as a progressive rural innovator for creative place making, fostering increased economic development through tourism – all while placing the artists and their work in the national spotlight. After two successes, there is great momentum for further large-scale, site-specific projects. Port Austin has set a goal to complete 8 installation art projects in the next 8 years for a total of 10 large scale installations. Goals for this grant are to continue this momentum, including: • Enhance livability and increase visitation for the area through creative place making. • Drive positive economic-impact outcomes through increased tourism and population growth. • Provide opportunities for Detroit-area artists to apply their work in a new context and reach new audiences, both in the area where their new work will be located and through national/international media attention. • Provide a platform for a unique cultural exchange of ideas between urban and rural communities that will benefit both through deeper understanding of each other.